The LEDPRO X6 On-camera LED Light is a flexible and lightweight source of illumination that gives you a variety of options when you need to brighten a scene. The unit's 63 super-white LEDs provide bright, daylight-balanced light outdoors, or if you need to match interior lighting, a swing-away correction filter gives you the necessary tungsten balance. A built-in dimmer allows for smooth modulation of brightness level, while two swiveling barndoors take care of light spilling into areas it isn't needed. Powered by four AA batteries, the X6, like all LEDs, never gets hot to the touch. With its bright, controllable beam, tilting head, and standard shoe mount, this affordable on-camera unit is indispensable to producing clean, colorful HD video and stills. 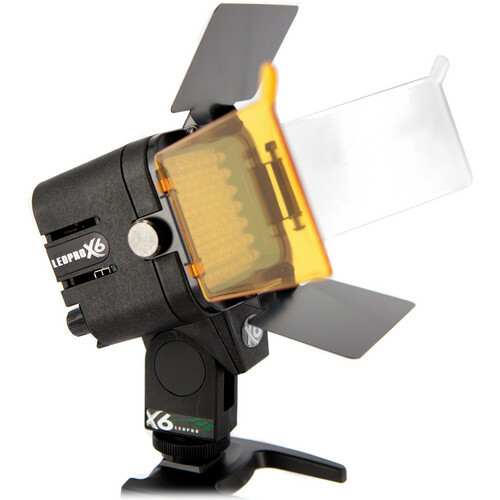 Box Dimensions (LxWxH) 7.1 x 4.6 x 3.6"
X6 On-camera LED Light is rated 4.4 out of 5 by 16. Rated 5 out of 5 by Vincent la grande from WAUW!!!! This is the most wonderfull small LED light I ever found. I guess the housing is made from the same material as the pelicases which makes it very very strong. So this is the first light I found that you can also do something with. I mean the light output is AMAZING!!! It took me about 2,5 hours to empty the batteries so that is pretty amazing also. I'va also measured the color temperature and it is spot on. apsolutly GREAT. If you are looking for a cheap and wonderfull LED light. Look no further. Again WAUW!!!!! Thanks LEDPRO. Rated 4 out of 5 by Peter from Bright well-made light for the money This light is solidly made and light weight...material similar to Pelican cases. It's very bright, although the company does not publish the wattage. It has a dimmer that works well, but it does not dim to zero. The barn doors are completely useless, because as you close them, the light starts banding, an odd effect likely caused by the rows of LEDs. The correction and protective filters work well, and the tilt feature is useful. And it has a 1/4-20. Overall a really good on-camera light for the money. It'll probably make a decent hair light too. Rated 5 out of 5 by Mertz from Compact, well-built LED on camera light This is the first time i bought an on-camera LED video light for my Sony HDR-FX1000 and it work perfect. It's compact, lightweight and illumination is good. The amber and the white diffusers works with fluorescent/incandescent lighting conditions is a plus. The two metal barn doors are okay since it protects the LED when closed. It's a great product and i would highly recommend it without adding weight to your gear on taking HD videos. I like it. I've been searching for this kind of video light since i bought my video camera. I received my order on time. No negative comment about this product so far since i used it couple of days after i received it from B&H. Rated 5 out of 5 by Anonymous from A sturdy and lightweight solution The X6 led light is well made and sturdy.It is adjustable by way or a side dimmer knob that can raise or lower the amount of light needed according to the situation. If you intend on using this light with a camcorder you will probably have to buy a shoe mount adapter kit.Not an expensive investment for a very well made light. The light also features removable barn doors and two light filters.Runs on four AA batteries- use rechargeable batteries. Rated 5 out of 5 by TXHOGG from Mandatory peice of equipment This light is built very sturdy. The material is similar to pelican cases. Light output is good. The dimmer switch is quality and rotates smooth. This light is definatly one of the best built lights out there for the price. Packaging is above average and not the cheap china packaging. Mount for the hotshoe has a screw that tightens for security which is a must for me for Guerrilla footage. Comes with a bag to store it. I use it on the Panasonic AC-160 and it makes this camera look like a beast! Rated 4 out of 5 by TV Guy from Solid build This is built better than average for LED camera lights. The beam is somewhat narrow--you'll see a bit of a spotlight effect shooting at wider angles. The tungsten conversion filter is questionable. Not sure what color temp it's really converting to. I can't blend the light usefully in any scenario. Rated 4 out of 5 by DG3 from Solidly Built, Light Spread Weak This is a solidly built light. A good, bright light with decent throw. I knock off a star for the light spread being weak. Since most of us have been shooting in the 16x9 format, having a light that fills ther whole frame is crucial. This light does not.